Non-profit directors and officers liability insurance is an essential coverage for all nonprofit and social service organizations. Most nonprofits purchase this coverage even if they don’t purchase any other insurance coverage. But what does it all mean? It is vital to the success of any nonprofit organization that they assess and understand the risks they face along with how to mitigate those risks. Some of the many risks to consider are those faced by the board of directors. Often the individual members of the board are unaware of the personal liability they face for their service and how they are protected. 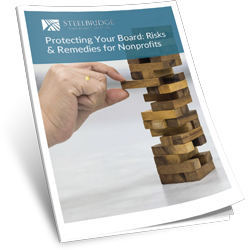 Download this whitepaper to learn more about the risks your board members face in their decision making and management duties and how to protect them.